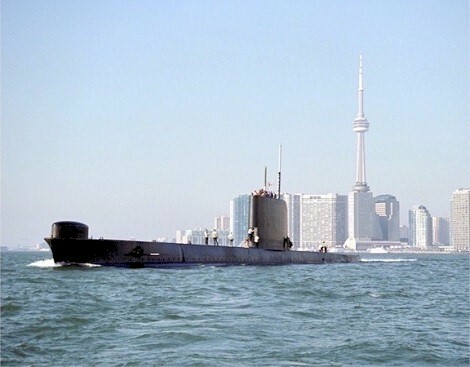 Built at Chatham, U.K., HMCS Okanagan was commissioned on 22 Jun 1968. 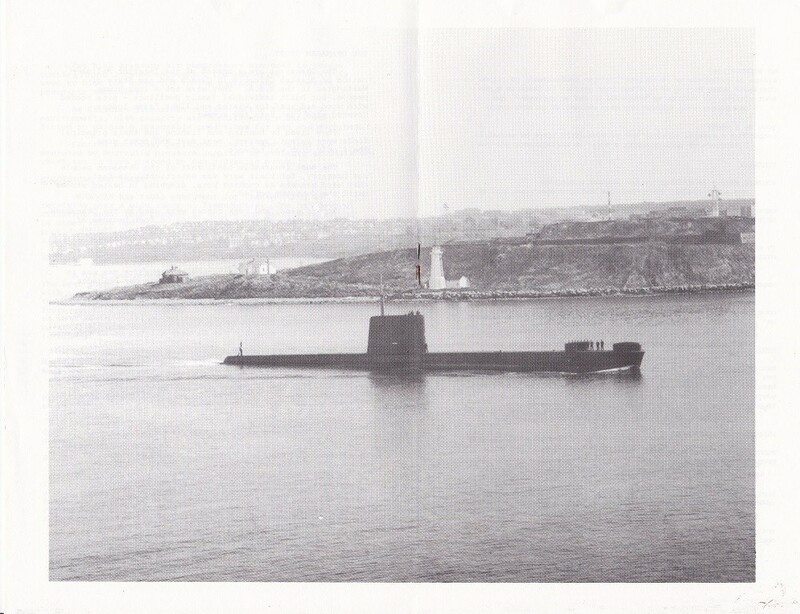 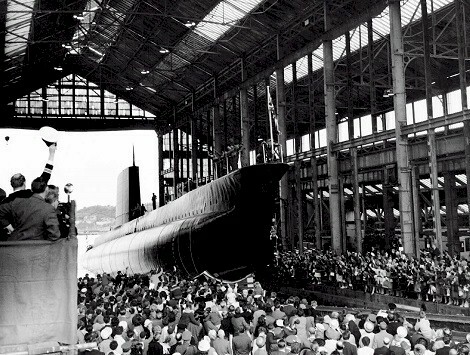 She spent her whole career based out of Halifax as part of the 1st Canadian Submarine Squadron. 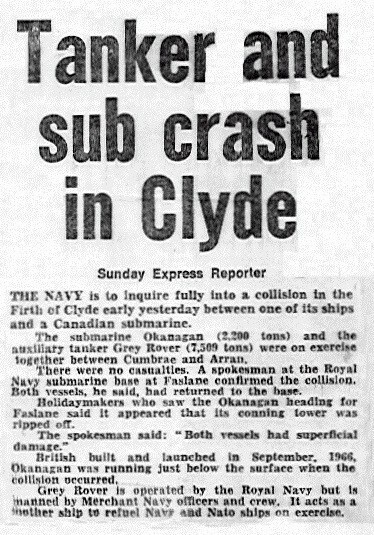 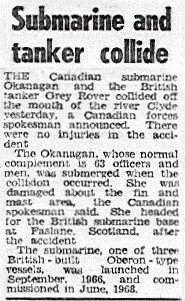 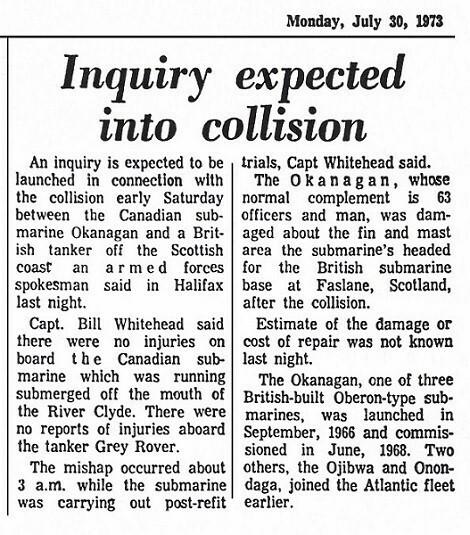 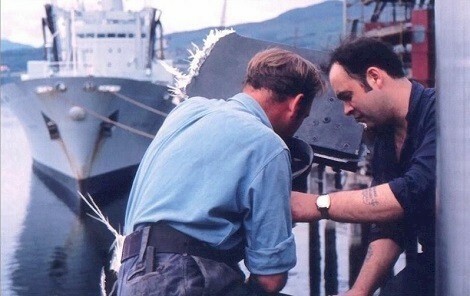 On 28 Jul 1973, RFA Grey Rover collided with HMCS Okanagan in the Clyde near Faslane, Scotland. 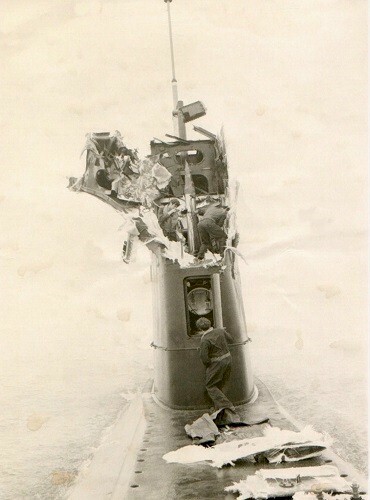 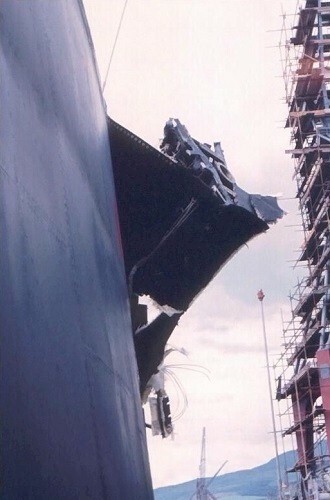 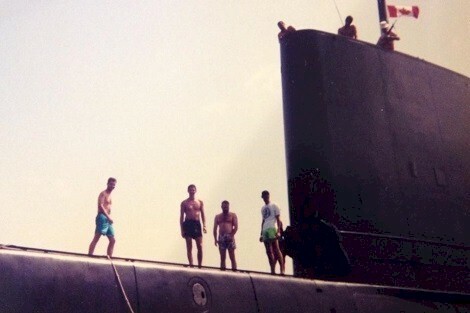 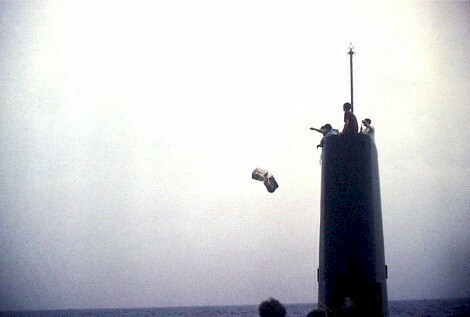 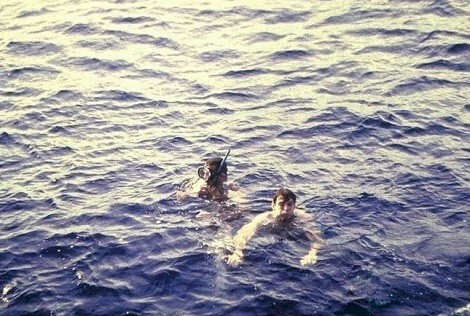 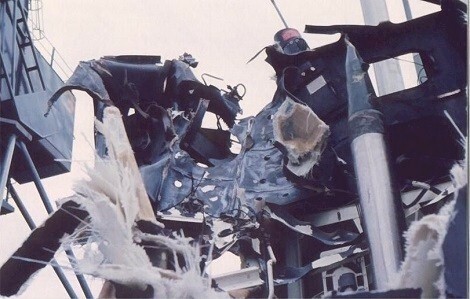 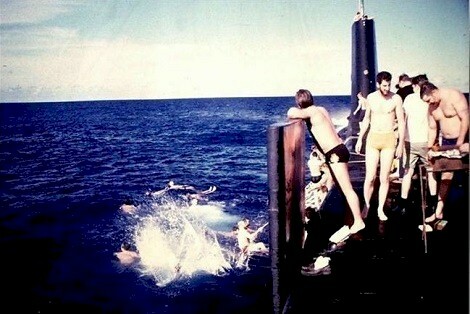 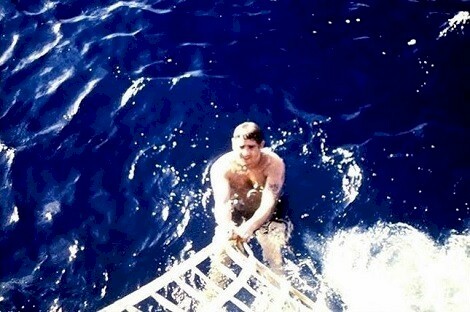 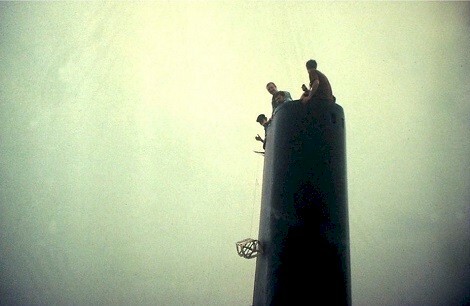 There were no injuries to the submarine's crew. 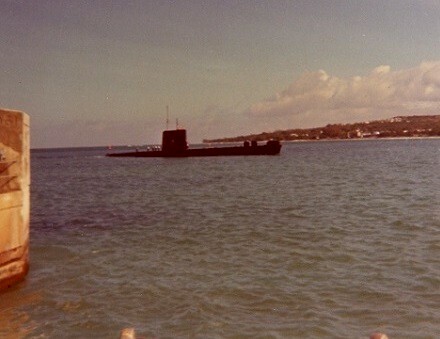 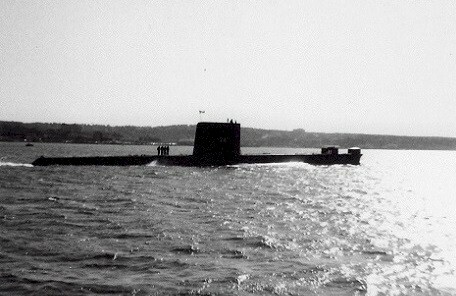 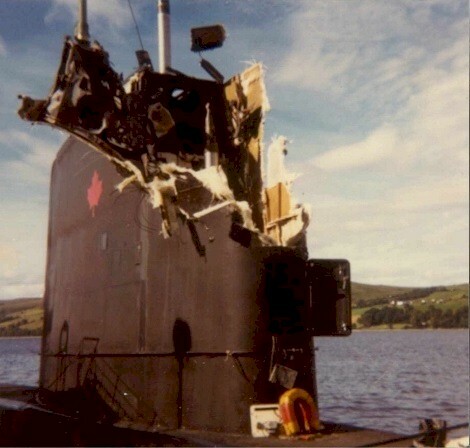 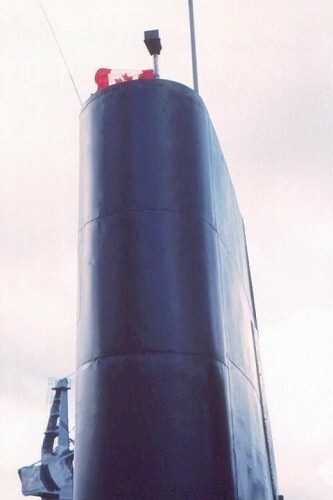 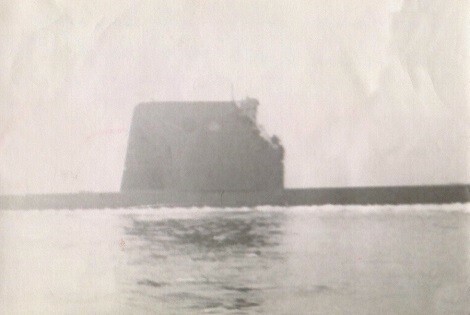 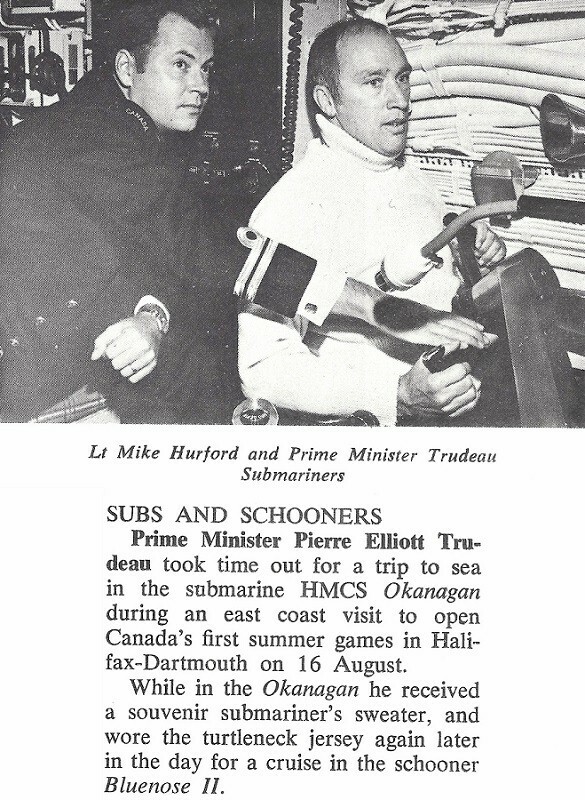 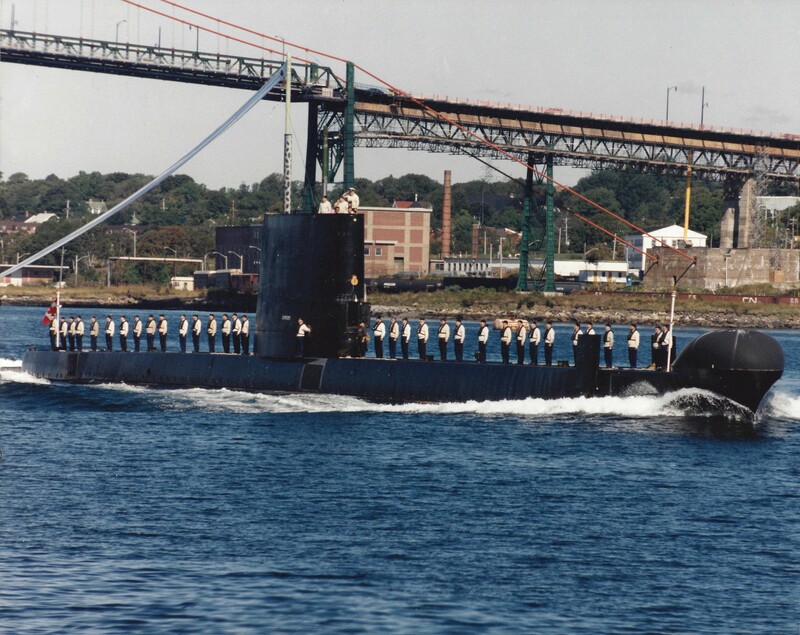 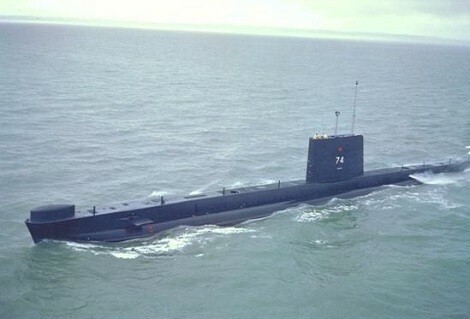 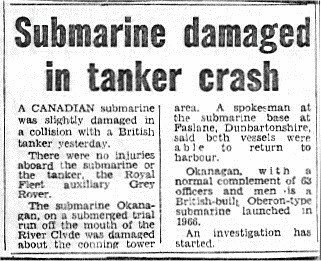 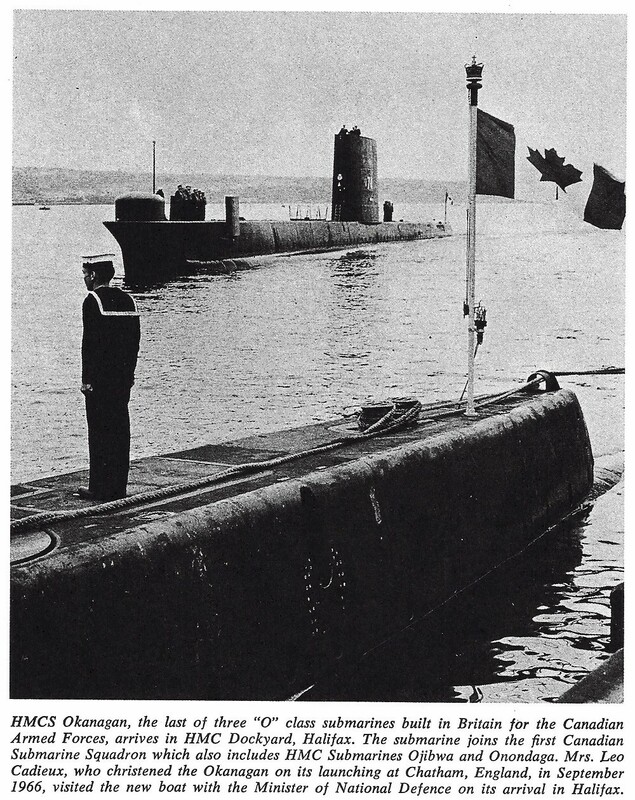 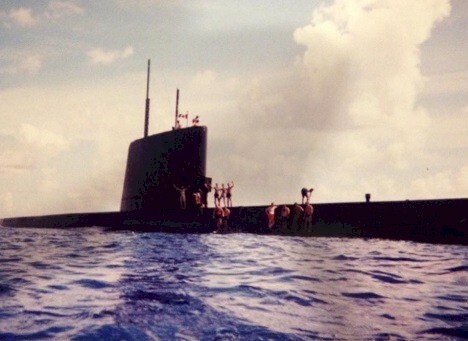 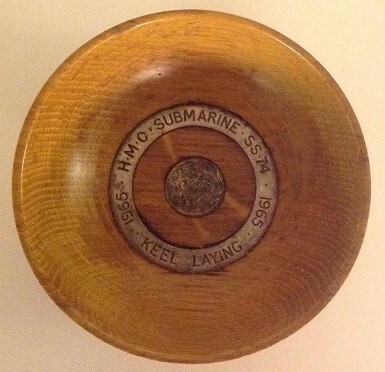 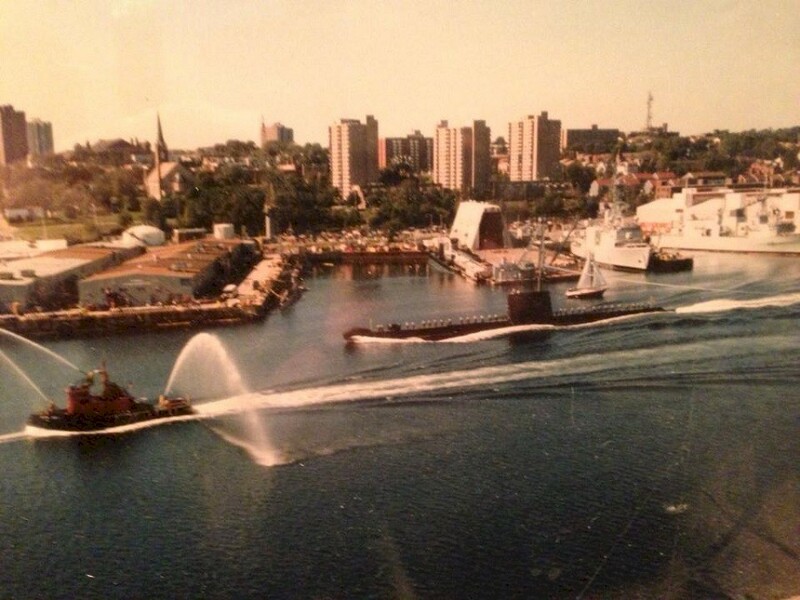 Okanagan became the first Canadian submarine to do a Great Lakes cruise in Oct and Nov of 1990. 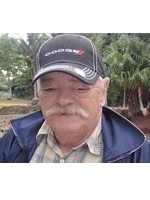 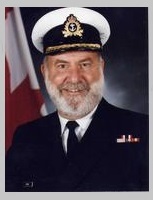 Served in Okanagan in 1976 as XO. 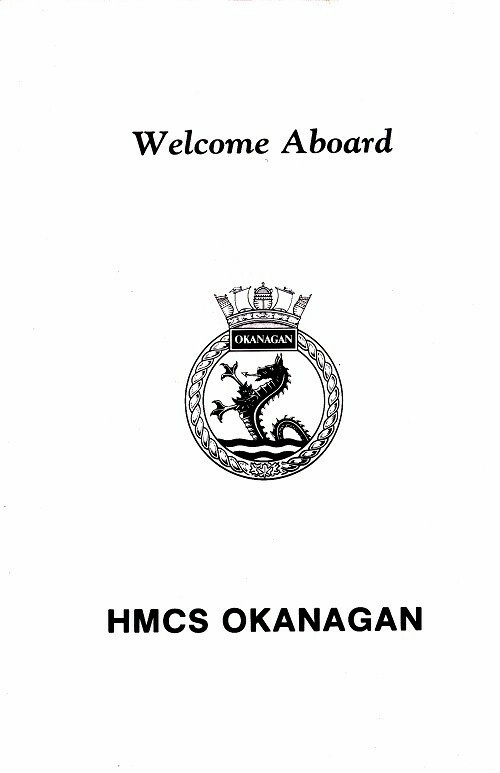 Served in Okanagan in 1986 as a MS.RM. 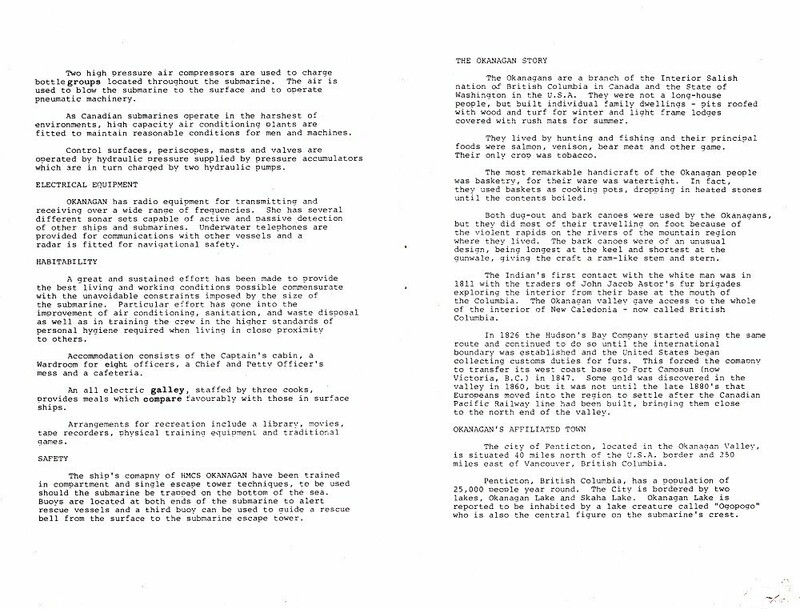 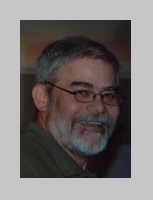 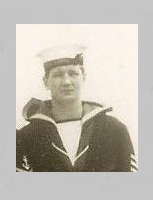 Member of re-dedication crew. 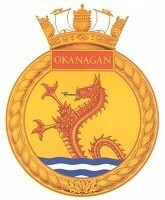 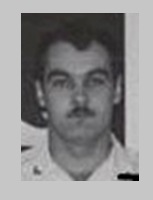 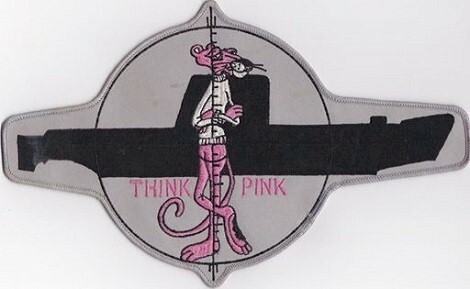 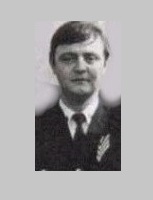 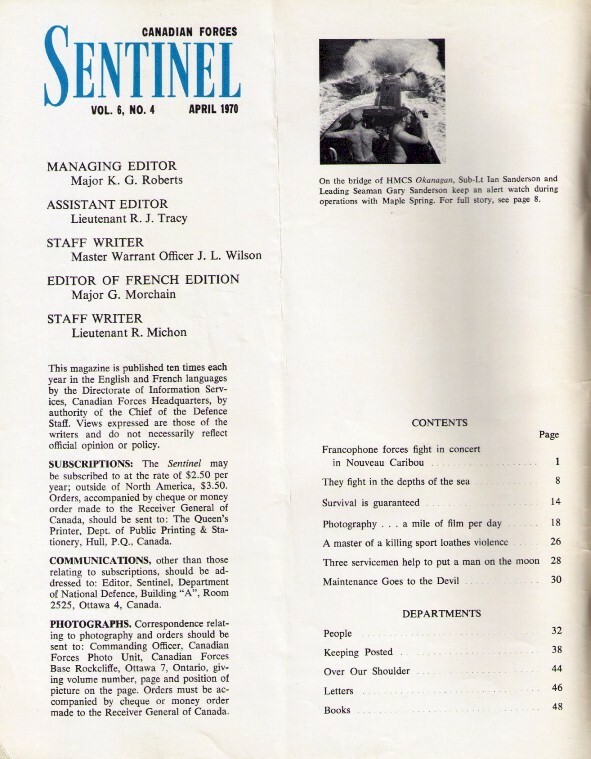 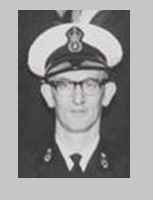 Served in Okanagan 23 Oct 1967 to 01 Jun 1969 as PO Tel. 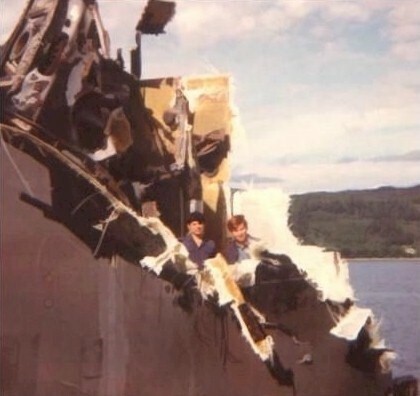 (3) (Left) Commanding Officer Cliff Crowe on the Bridge. 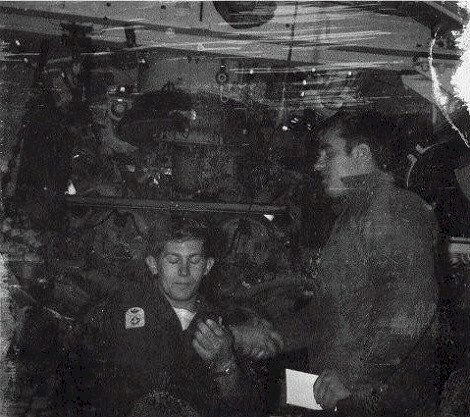 (Right) a look into the Engine Room at 77 Bulkhead. 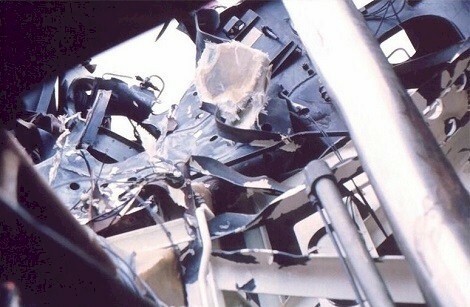 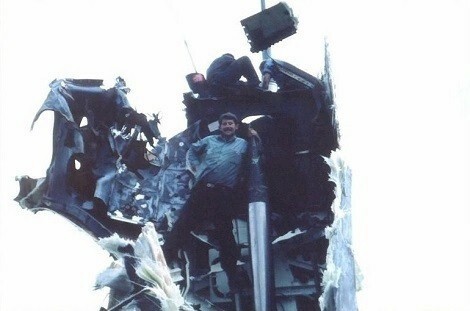 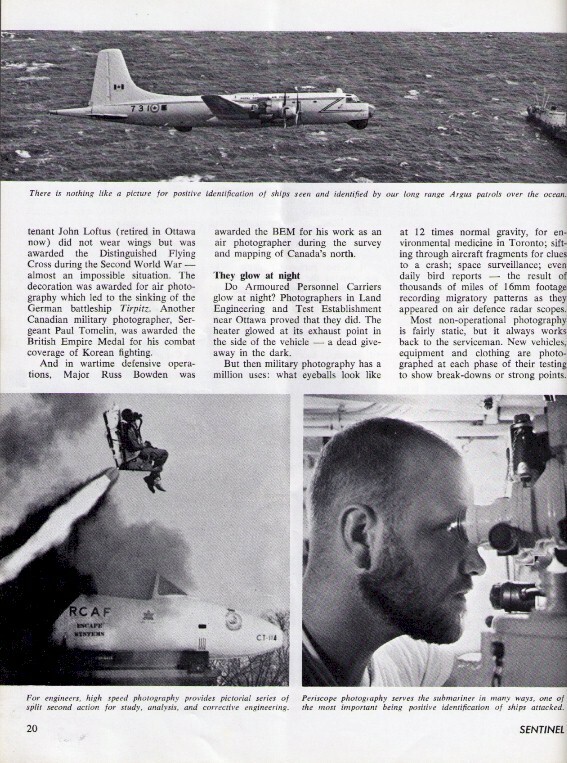 (5) (Top Left) Lt Bill Sloan on the Bridge. 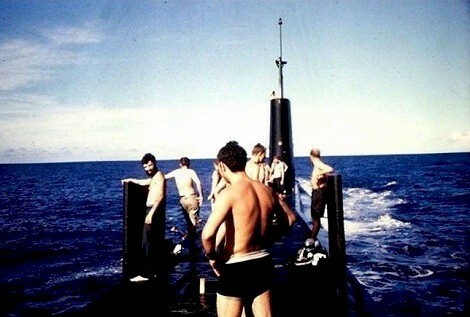 (Top Right) is some crew on Forward casing enjoying the sun. 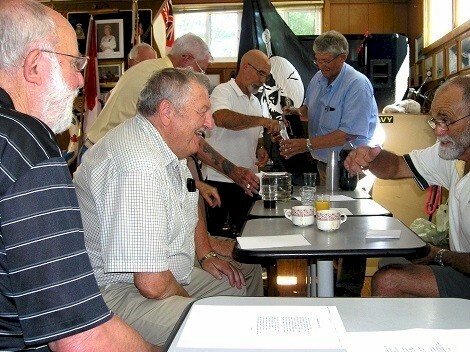 (Bottom Left) (L-R) is LS Bob Mizuik, LS Paul Renner, LS Pat Rodden, LS Bob Evans, LS Keith Estabrooks and standing is LS Brian MacEachern. 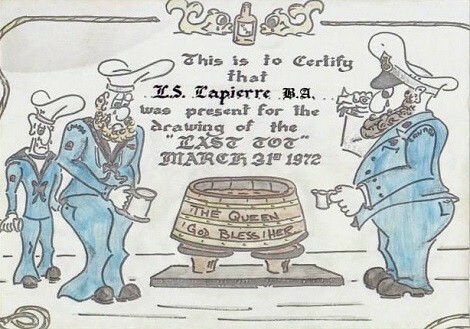 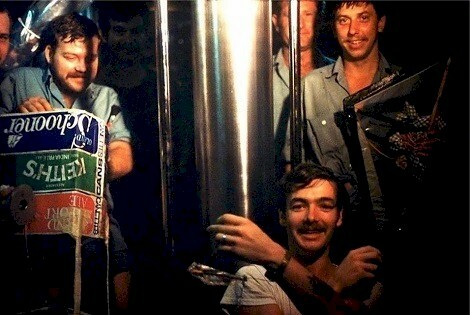 Taken in the After Torpedo Room during Tot Time. 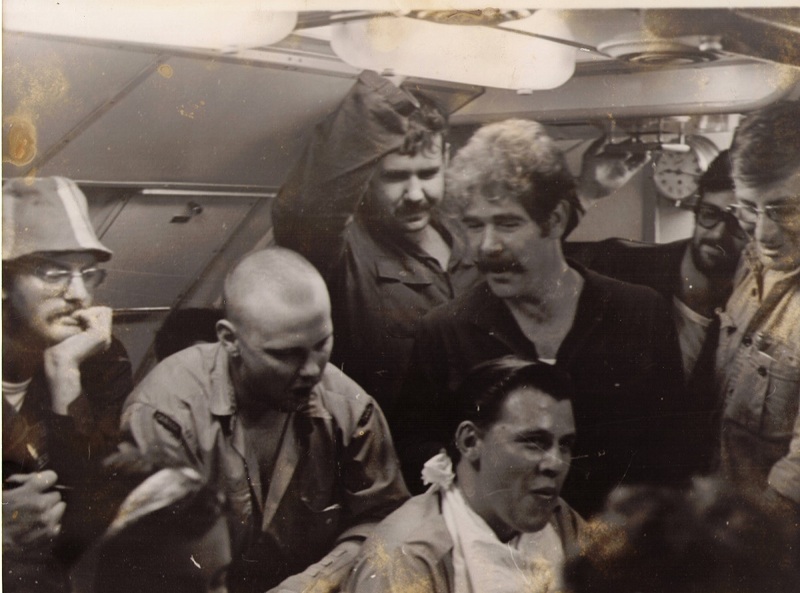 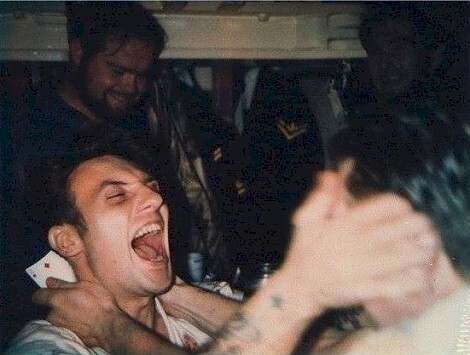 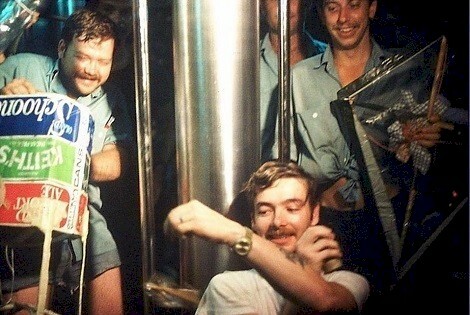 (Bottom Right) is PO1 George "Buddy" Thomas cutting Lt. Terry Jones's hair with AB Dave Van Kruiz looking on in Forward Torpedo Room. 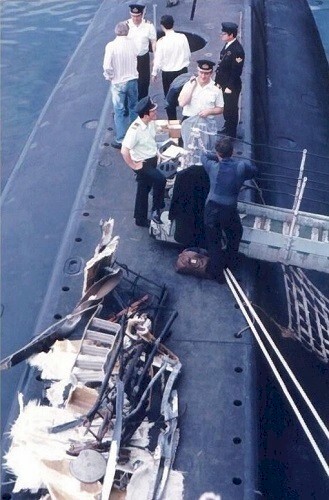 (6) (Top Left) is crew on Fwd Casing getting sun. 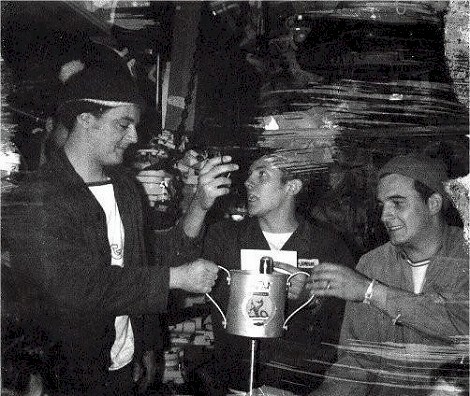 AB Brian Lapierre is at left drinking from a Coke can. 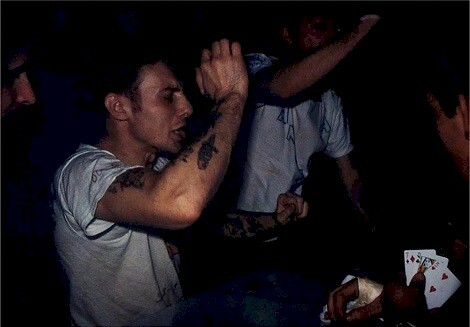 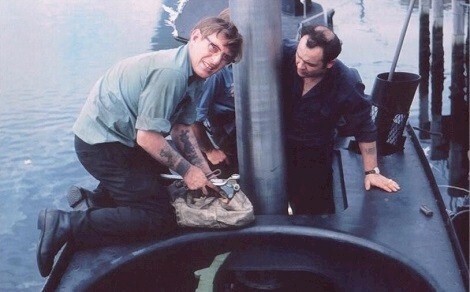 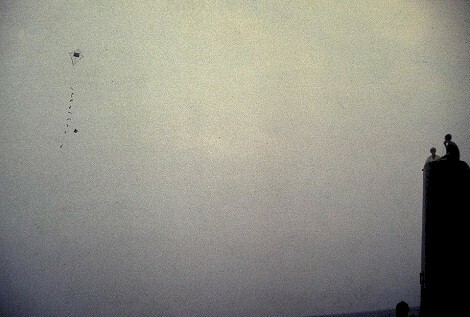 Others is photo: LS Jerry Conway, LS Paul Renner with cigarette. 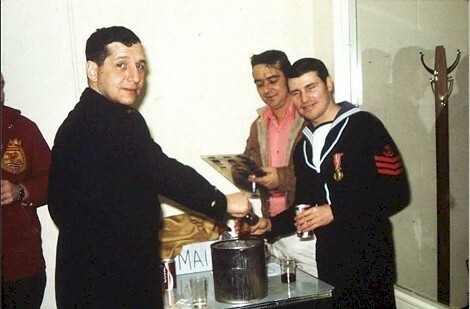 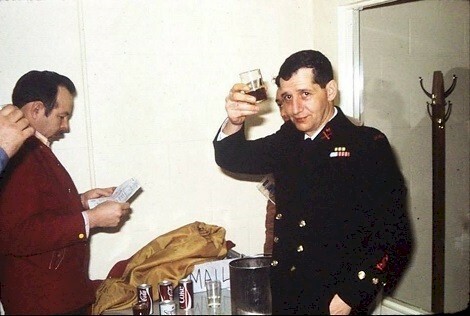 (Top Right) Lt Terry Jones & LT Lloyd Barnes in the Wardroom. 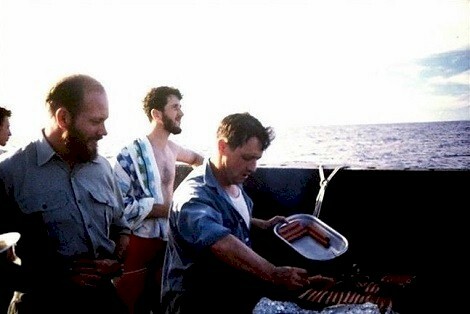 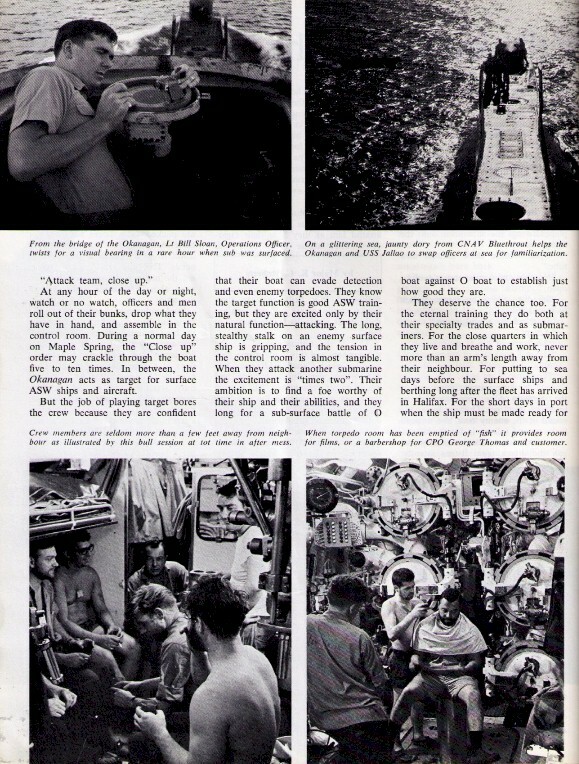 (Bottom Left) AB Steve Higdon in the Galley. 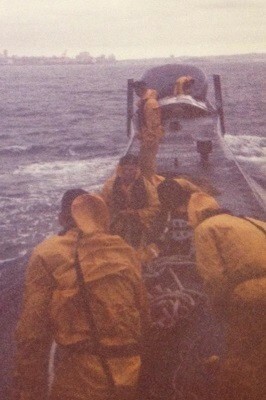 (Bottom Right) a Fire Exercise outside the Galley at Bulkhead 49. 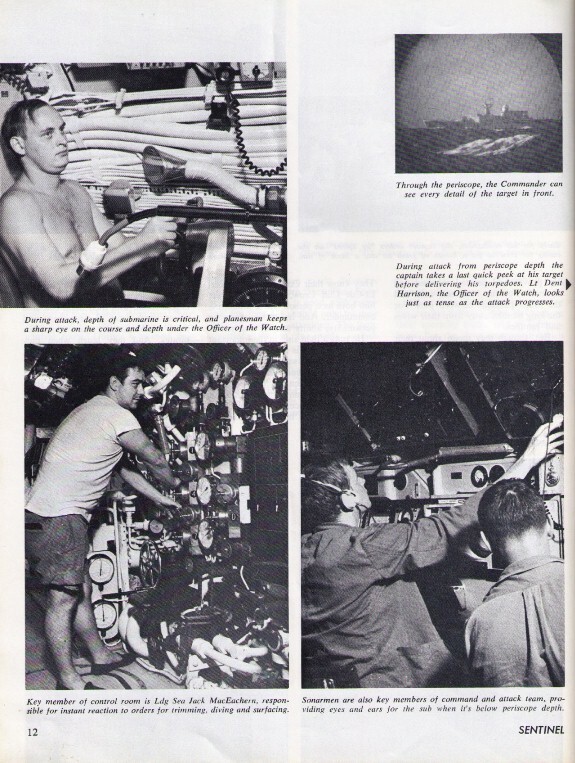 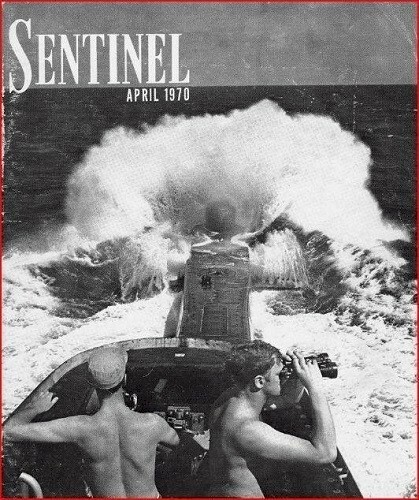 (7) (Top Left) LS Fred Schatz on the helm. 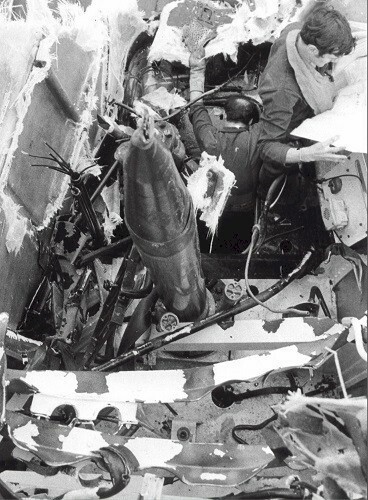 (Top Right) a Target. 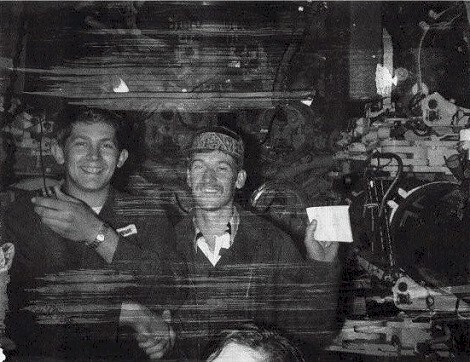 (Bottom Left) LS Brian MacEachern on the Main Blowing Panel in the Control Room. 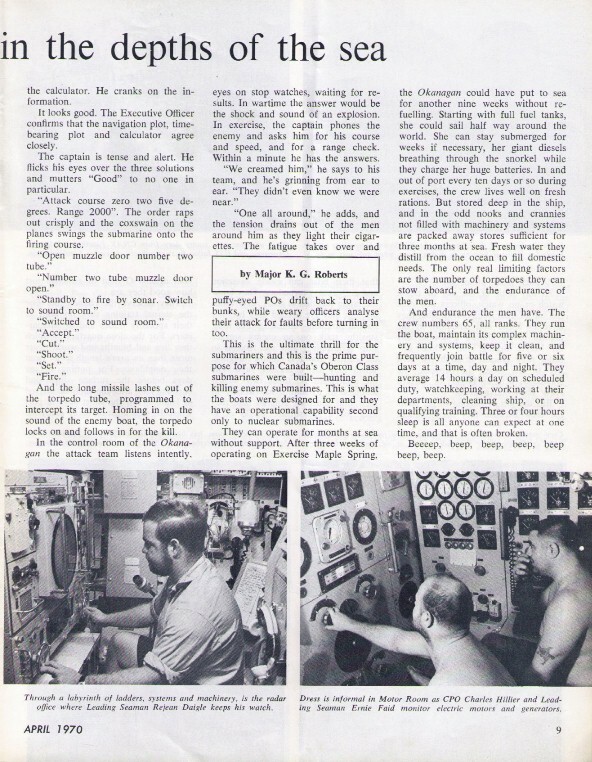 (Bottom Right) is LS Bret Aubrey in the Sound Room with headphones on. 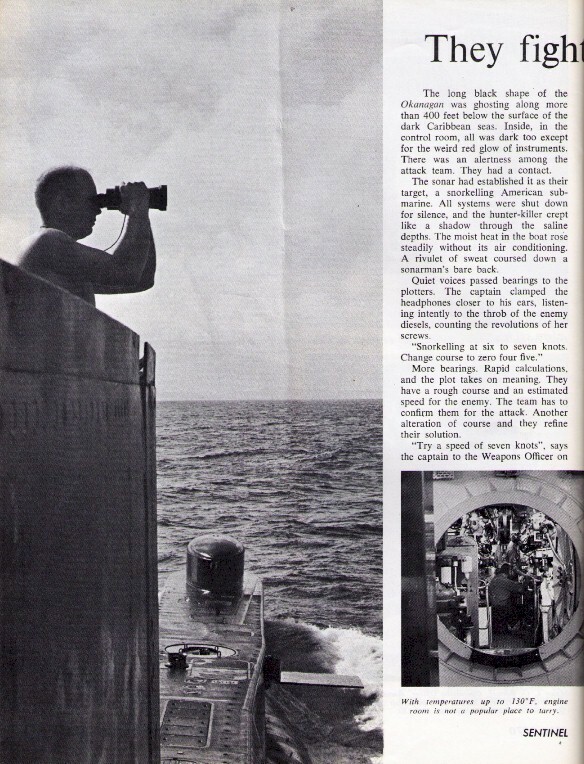 (8) Commanding Officer Cliff Crowe on the Fwd Periscope with XO Dent Harrison as Officer of the Watch in the Control Room. 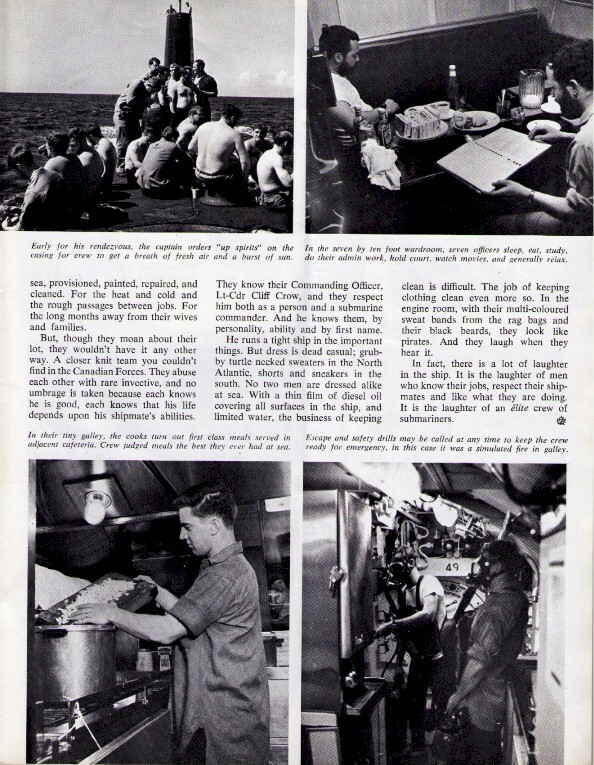 (9) (Bottom Right) Lt John Smith, Engineering Officer. 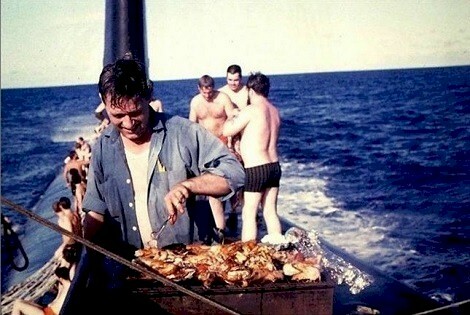 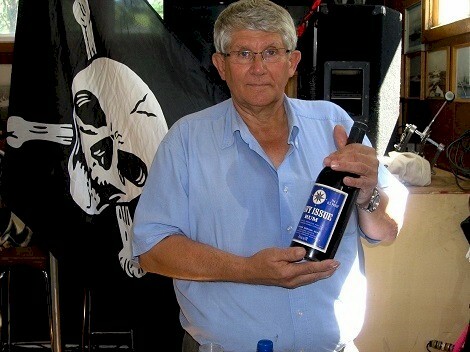 He eventually couldn't go to sea anymore so became a Medical Doctor in the Military. 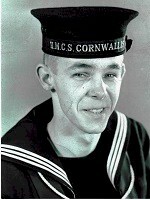 Still has his practice in Mineville, N.S. 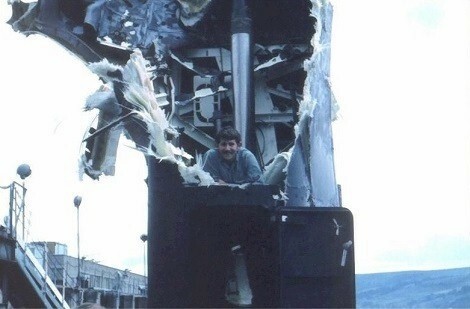 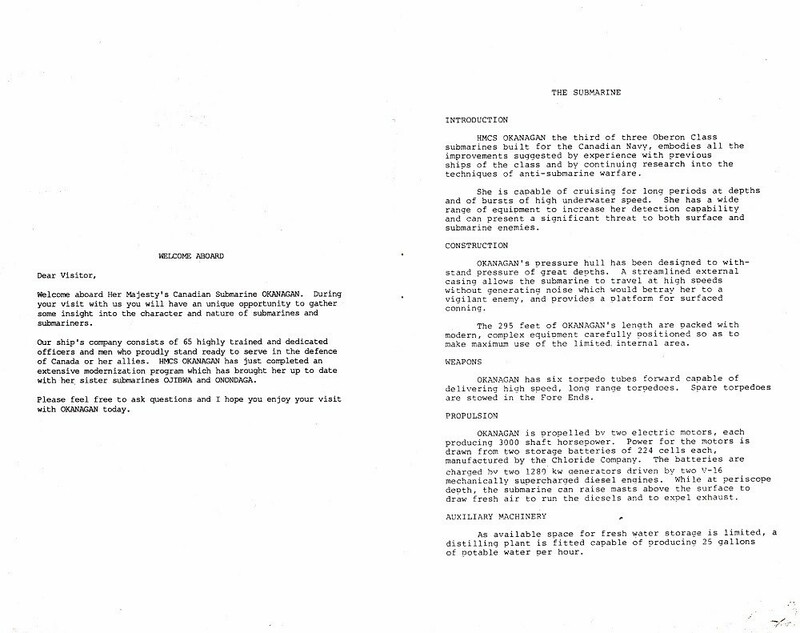 Retired as a Commander. 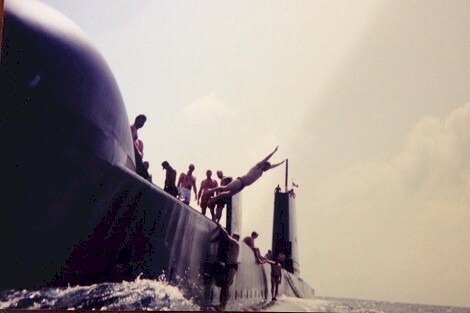 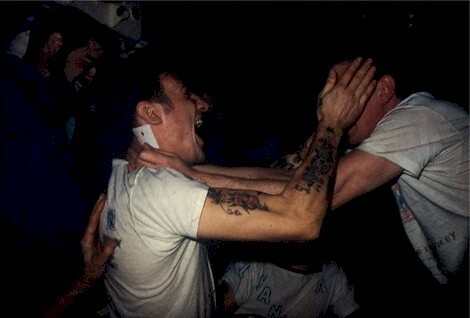 Every submariner who has gone to sea knows the routine. 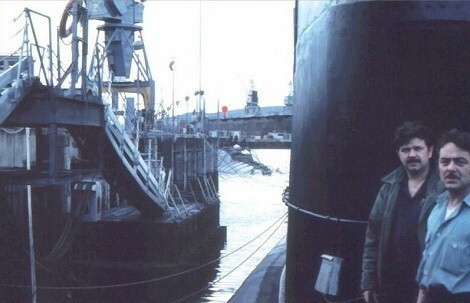 Many hours of work, watches, sleep and then repeat of the same. 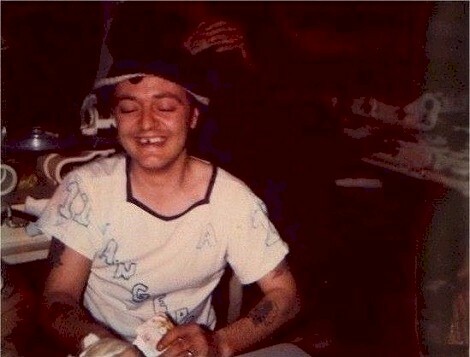 Time can pass very slowly sometimes. 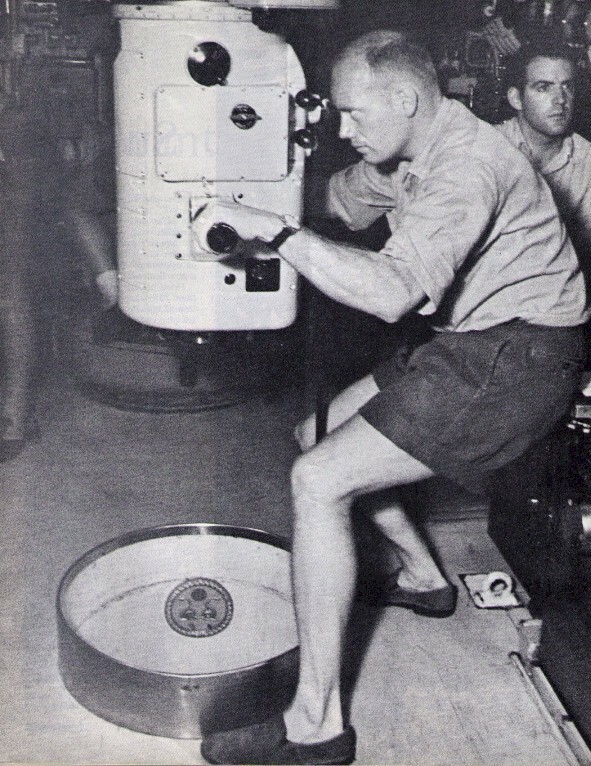 In a persons off time you would probably read or watch the evening movie in the "forends" on the old 16mm projector before the days of VCRs and DVD players. 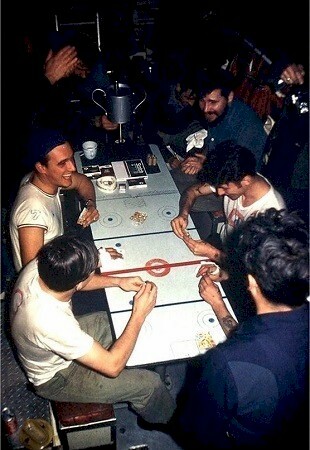 In the early 70's I took an old card game and turned it into a tournament. 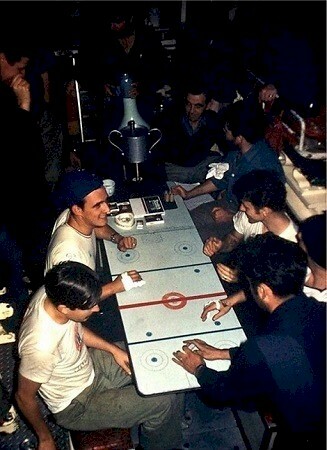 We had two players per team, all of the teams in the NHL at that time. 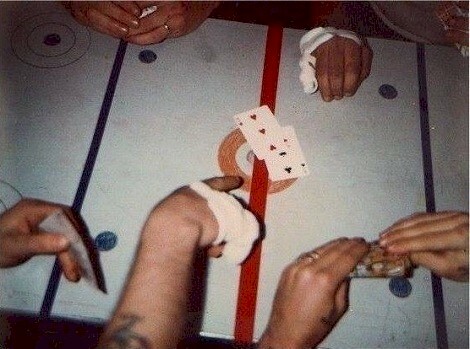 We played the typical NHL schedule then went into the playoffs. 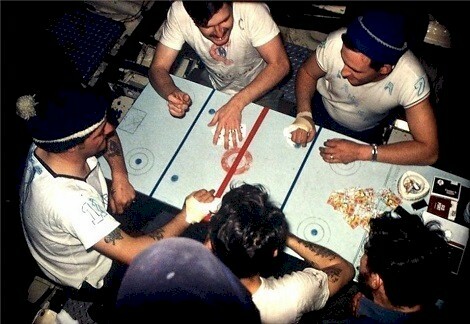 The finals of course being held in the "forends" complete with spectators, hand made jerseys and the "Okanagan Cup" made by the engine room staff out of a grease can, painted silver with the boats crest and a red light on top which could be flashed when a goal was scored. 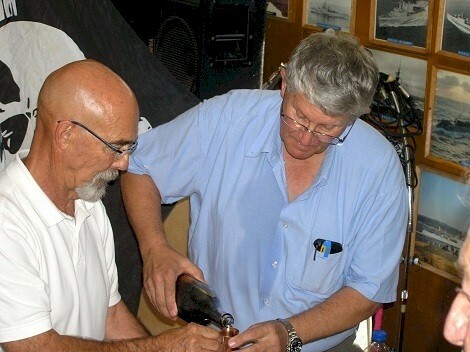 These tournaments brought great fun for participants and spectators alike. 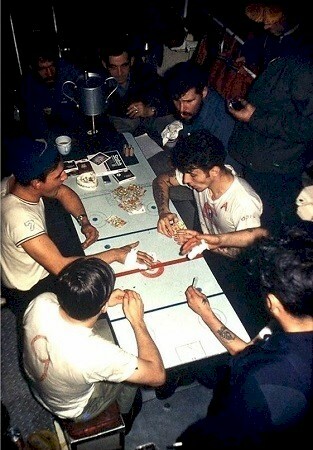 1971 - Montreal Canadian with Herbie Wambolt and Peter Llewellyn defeated the New York Rangers of George Reach and Vic Carter. 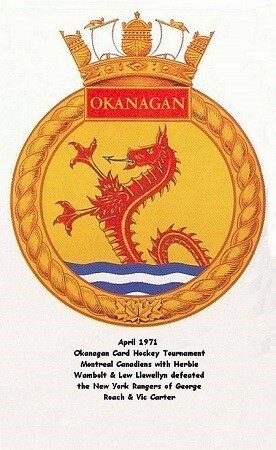 1974 - Vancouver Canucks with Doug Cameron and Gord Hamilton defeated the Buffalo Sabres of Vic Carter and Brian Cooper. 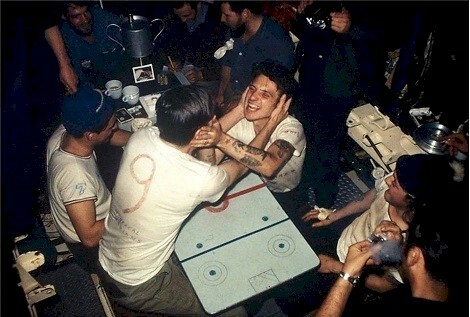 (9) Recognized are Bob Evans, Stu Hall, Wilfie Broyden, George Roach, Peter Llewellyn, Herbie Wambolt and Vic Carter (10) Recognized are Reggie Daigle, Fred Childs, Herbie Wambolt and Peter Llewellyn (11) A graceful loser, Vic Carter (12) "A goal" (13) President Brian Lapierre presenting "winnings" to Larry Schneider (14) President Brian Lapierre presenting "winnings" to Doug Cameron (15) Vic Carter, Brian Lapierre and George Roach with the "Okanagan Cup"
This is a crew list of those that were on HMCS Okanagan S74 on 28 Jul 1973 when she was hit by RFA Grey Rover. 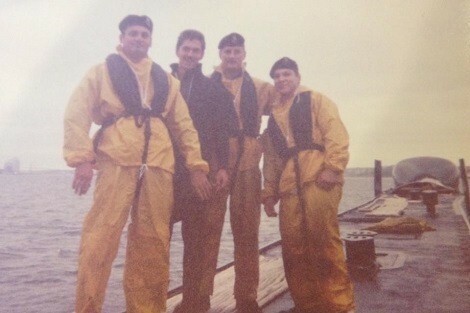 (1) Recognized on the bridge is Rick Limoges (2) Rick "Beercan" Limoges, J.J. Surette, Brian Cooper, and Pierre Alarie preparing their kites on HMCS Okanagan (3 & 4) Rick "Beercan" Limoges, J.J. Surette, Brian Cooper, and Pierre Alarie preparing their kites on HMCS Okanagan (5) Recognized is Mitch Ewan (6) "She's flying"
A few of the crew onboard HMCS Okanagan around summer of 1976. 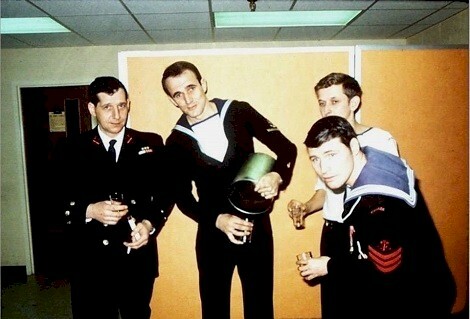 Taken in Okanagan's cafeteria. 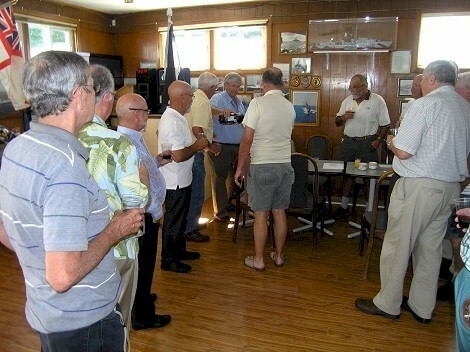 Okanagan was the only Canadian Oberon with a cafeteria. 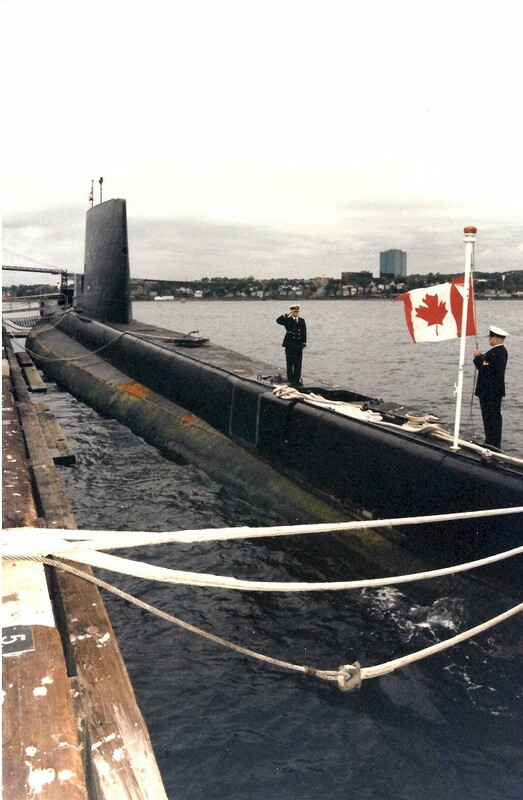 HMCS Okanagan is paid off and the ensign is lowered for the final time. 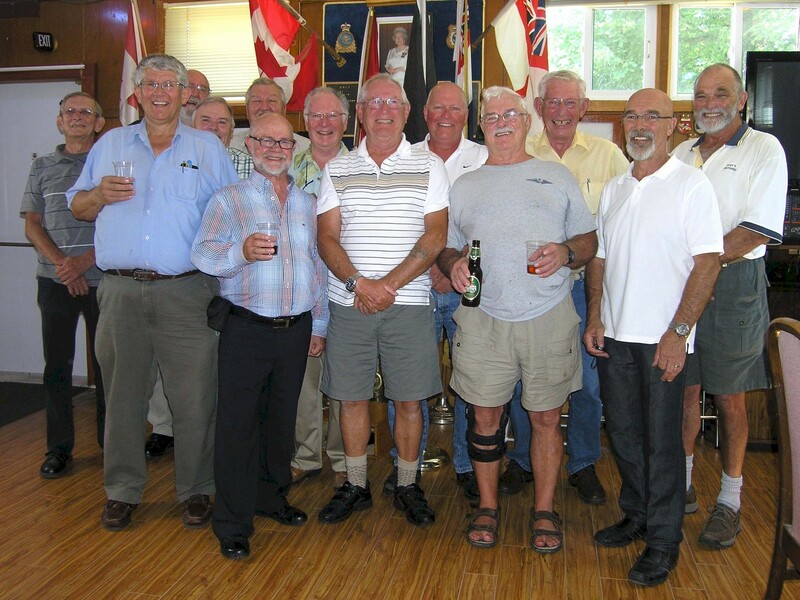 Members of the "Crunch Bunch"
Crew members of HMCS Okanagan, who were on board when she was hit by RFA Grey Rover, got together in Halifax for a reunion on 28 Jul 2013.